Sta. 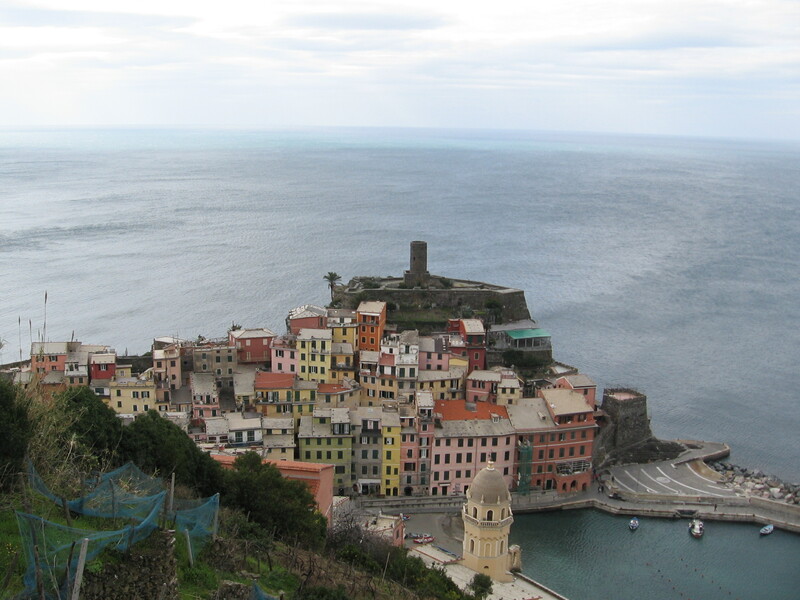 Margherita/Cinque Terre, Italy…and next stop, Turin..
Sta. 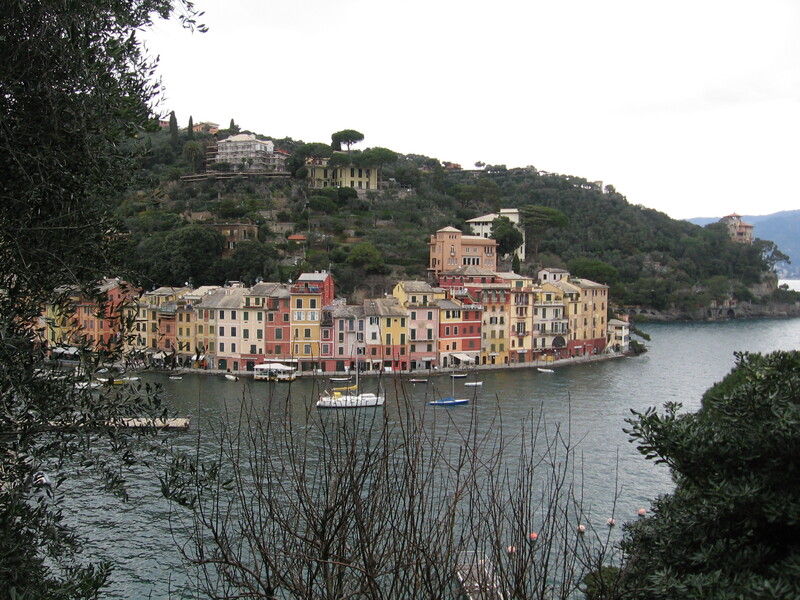 Margherita/Portofino — the Italian Riviera — very cool. 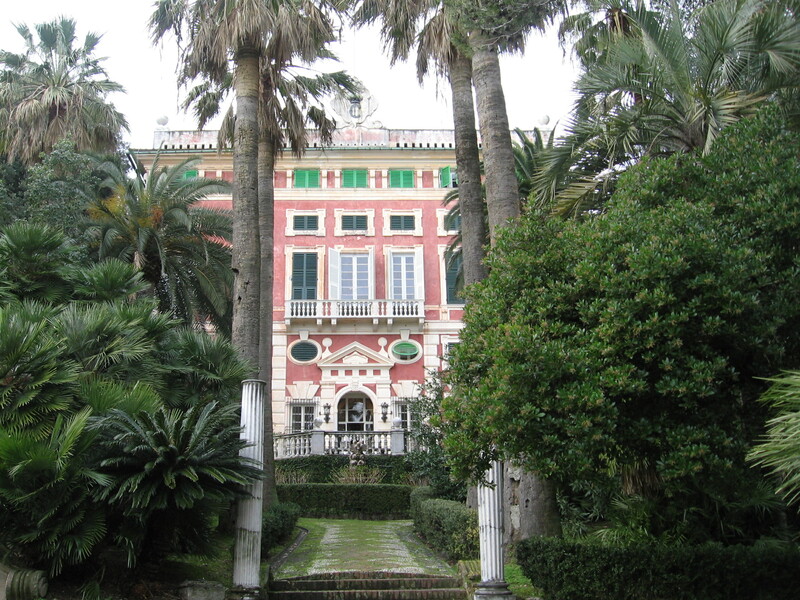 Cobblestone streets, centuries old villas, — wonder if it was like a “villa competition” in the 17th & 18th C. – who could design the most ornate villa w/the sumptuous gardens? — a centuries’ old version of: Jackson Hole, Wyoming & dueling architects I.M. Pei /Frank Gehry /A. Predock — but in 1687, it would have been Sr. ??? No idea! These “small little summer getaways” for the family and 20 staff members are gorgeous. Currently, they are in all stages of renovation. Little trattorias tucked in here and there .. the main road along the coast introduces one to the ever-present Hermés Store signifying that the town is “hip”, Yachting Days = here-come-the-$200-blue-and-white-striped-cotton-t-shirts, and Il Bambino shops selling mommy-daddy-look-a-likes for 200 euros. Walk 1 block off the main street and there is the local town with the hardware store, outlet shop, shoe repair shop.. the locals are welcoming and there is an air of “whatever” here – where your Levi’s into the white linen tablecloth restaurant, it’s ok – wonder what it is like during the summer? Probably a zoo.. the train station is close to town, easy access..buses run from Sta. Margherita to other coastal towns… the touristica boats operate from April thru October taking tourists to the coastal towns … seasonal living on the Mediterranean. Not crowded here now, and what a treat for me! Walked from Sta. 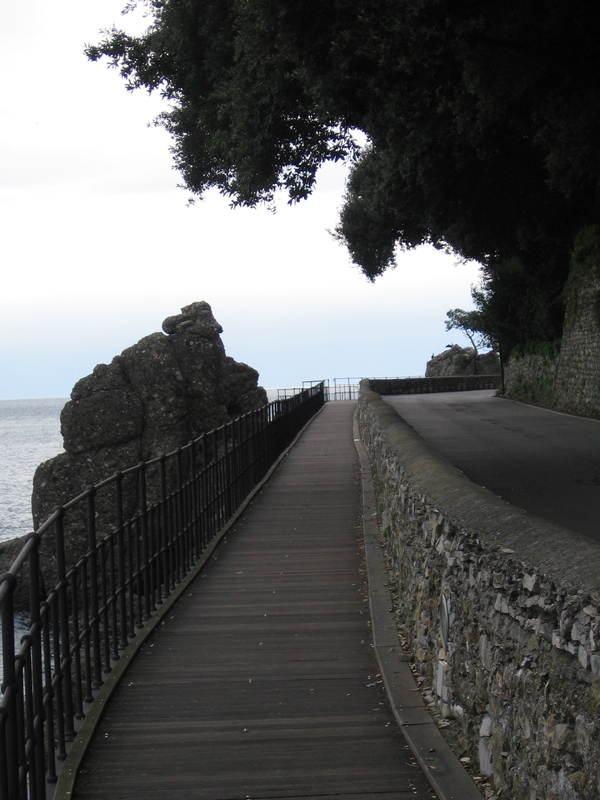 Margherita to Portofino(5 KM) along the Mediterranean Coast and thru the hills on a designated pedestrian path…had a cappuccino, thinly sliced dried beef with chunks of parmesan cheese and watercress, and bread in Portofino before I headed back. The waiter rolled his eyes and nodded when I said “April – lots of tourists?” But now, life doesn’t get much better than this — I feel so lucky to spend 2 or 3 days in these places – and see not only the tourist sites, but watch local life. My base was Vernazza – one of 5 little villages built during the 10th century(+/-).. trails connect one little town to the next, and also accessible by a railway system thru the mountains. In 1997, this area was designated a UNESCO heritage site. 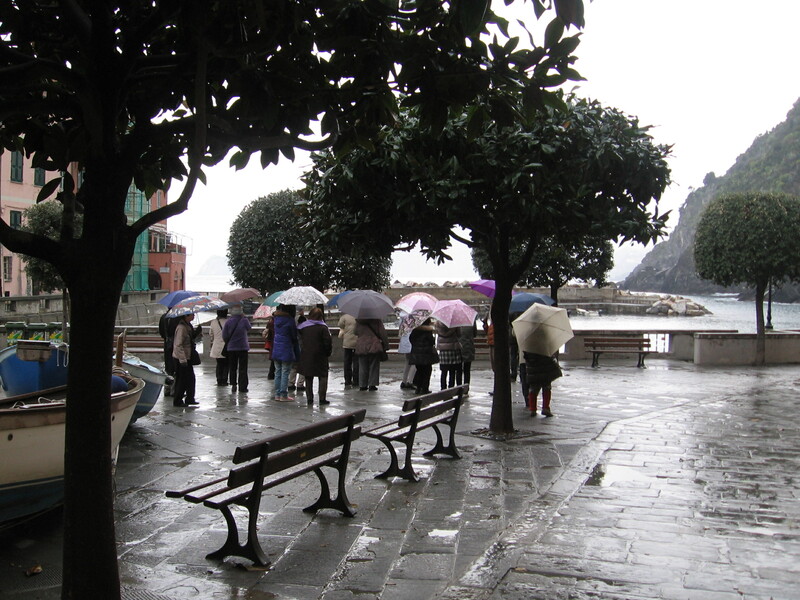 Around 12 years ago, guidebook writer Rick Steve’s did a piece on Cinque Terre, and opened it up to the world of tourism. I arrived via train from Sta. Margherita, walked into a cafe, ordered a ham/cheese Panini and asked how to use the pay telephone so I could contact the innkeeper for directions to my room. The young man at the restaurant explained to me the Italian pay-phone system. With very specific instructions, even down to the difference between the Italian ringtone and the US ringtone(! ), only obtainable from a person who has dealt with numerous tourists in his lifetime, I contacted the propietor who sent his MOTHER to meet me. We walked thru the town(500 feet) and up the 107 steps to my room. Looking out my bathroom window, I saw rock terraced gardens on mountain hillsides that should be in every agricultural textbook entitled “Mountainside Farming ”, and, from my bedroom window, the Mediterranean Sea greeted me. It was as if I had taken the time machine back to 1 A.D. The next 48 hours were Christopher Robin blustery days, but I ”buttoned up the cardigan, old girl” as the English say, and explored the Cinque Terre area. Coastal trail #2 was closed but all the other trails were open. I walked up mountains on smooth stone worn paths, “one foot exactly in front of the other” size paths, and streets thru towns following the occaisional small red/white painted stripes trailmarker. The trails were not difficult to figure out — sea on the right, mountain on left! 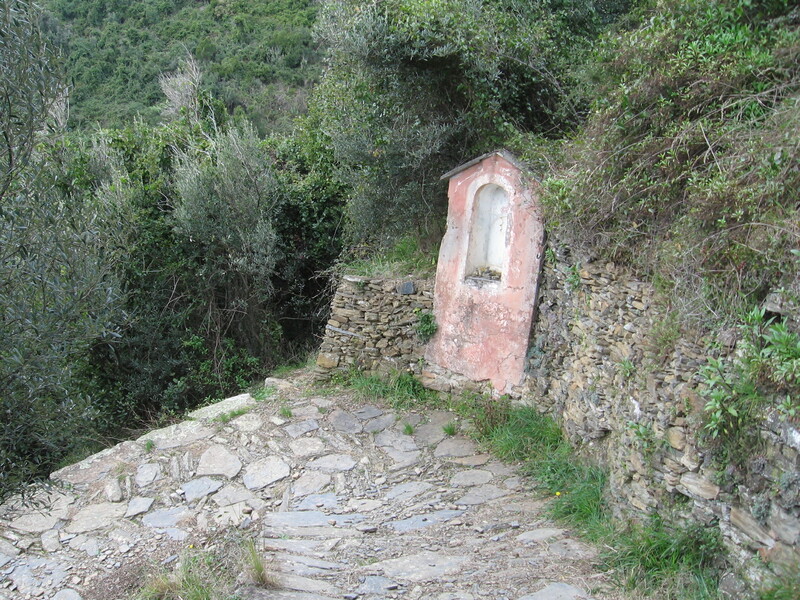 On these paths, I saw terraced mini farms filled with lemon and olive trees, farmers tying up grape vines, terraced walls in various stages of repair, vegetable and flower gardens, shrines depicting the different Catholic stations of the cross and a 10th C. church. Church bells rang in the mountains and marked time passing. 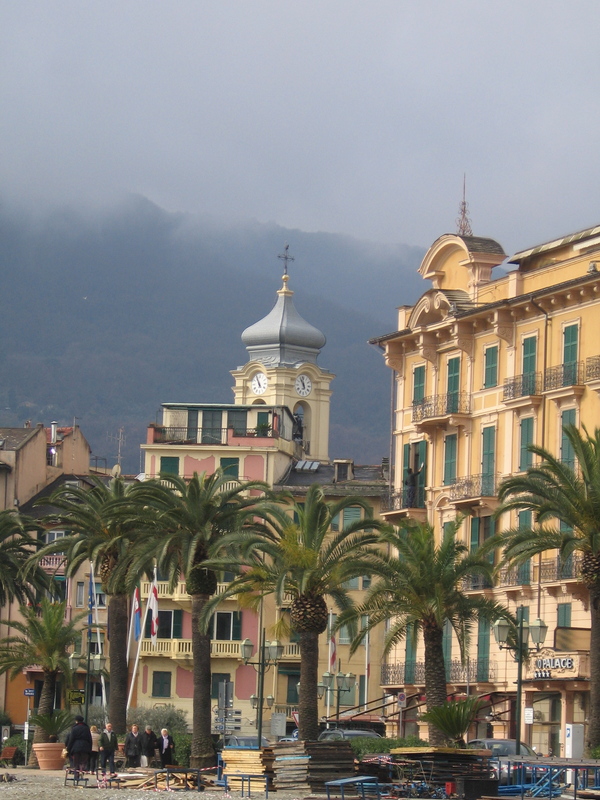 When 2:00pm echoed in my ears, I knew it was time to head back – and eventually, the following thought became paramount in my mind: “I think, I will just take the train back.” When one encounters the following signs: “365 steps ahead is the town of Corniglia” and there literally are 365 stairs…or..”2.5 km -Manzola/2 hours” – neither of these signs indicate easy walking. The STAZIONE beckoned me , and for 1 €, 7 minutes worth of time, and no body movement required except getting on/off a train = I am so-o-o there. The healthy snacks bit the dust and the replacement was the absolute best pizza I have ever had in my entire life. Two excellent seafood dinners(stuffed mussels(#1) and spaghetti with clams & mussels(#2) were consumed in different trattorias, and I spoke with more Americans than I have in the entire seven months I have been traveling. Casual dress, easy-going pace — so different from the Italy I have seen so far with chic dress de rigour — most likely because it caters so much to the “hiking/outdoors group”. 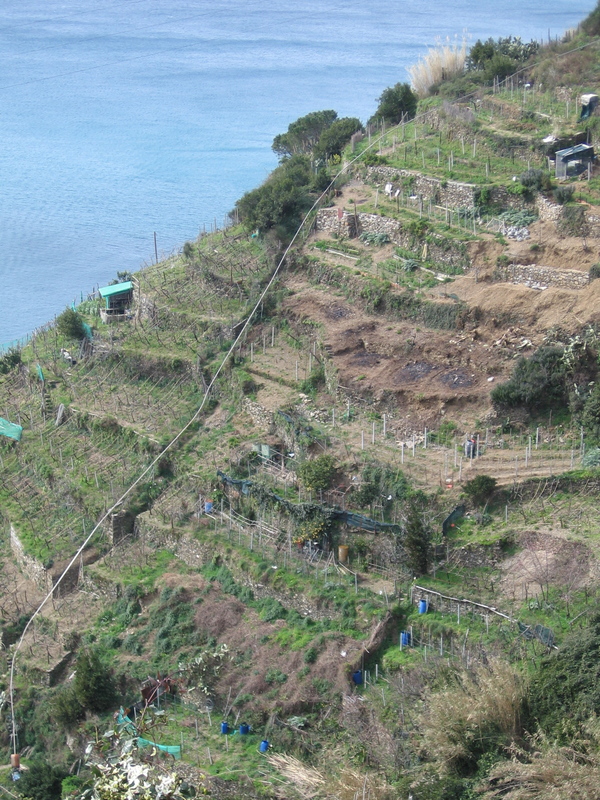 Cinque Terre has tried hard to keep its “ambiance” and, for the most part, has succeeded. It really is a special place. From April thru October, the visitors fill the towns to capacity and support the tourist based economy of postcards/t-shirts/B&Bs/bike,horse, boat rental industry, etc. So, although the eyes roll and people lament having to deal with the tourist, the residents receive substantial income is from the tourist trade. Like most tourist towns, once the “season” is over, the locals go back to their favorite coffee bar counter, drink their morning or afternoon espresso, discuss local events and continue on with life as the previous generations did for centuries in these hillside towns where the current sign says: “no autos allowed”. No idea what they are looking at!! I love your last picture with comment. How beautiful it all is Lisa and how fortunate are you!!!! Enjoy! Glad you made it to Cinque Terre. We loved it in the off-season too. It just makes me want to be there so much !!!!!!! And now you have made me hungry too……..
Greetings from Friday Harbor. I will share this with Mary Helene when we see her this weekend. It is great fun to follow along. It just sounds like so much fun! Cinque Terre sounds like a settling place for me. You are blessed. Thanks for sharing and great writing. from patagonia to turin …. the stories keep unfolding …. please, please, please keep telling them! Lisa: I just returned from off season travels in UK and it is the thing to do. So much easier to go with fewer folks around. I will post some pictures too soon. Glad you are still doing well. Pictures are great! Thanks.